NEEDHAM - In his darkest moments, Michael Haas felt as if he were sinking in the ocean, a weight strapped to his feet. He cut himself with razor blades and at times thought he would rather die than show up for class at Needham High School. It was fall 2005. Three Needham students had already committed suicide, and there would soon be a fourth. And as Haas, just 16, flirted with suicidal thoughts of his own, his parents, Chris and Ronnie Haas, were busy planning Michael's college education, not seeing signs of his deepening depression. It is the classic parent-child disconnect, mental health specialists said yesterday at a State House forum about teenage depression. Specialists say that depression often goes unnoticed by parents, which can lead to more serious problems, like the suicides in Needham or more recently Nantucket, where three teenagers - ages 15, 16, and 17 - have killed themselves in the last 11 months. The problem with teenage depression, specialists said yesterday, is that many people do not want to or do not know how to talk about it and often retreat into silence for fear of what others might think or say. 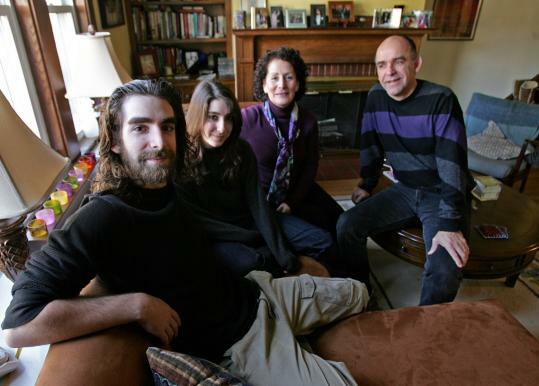 But led by Michael, now 18 and a senior at the Cambridge School of Weston, the Haas family has taken a different approach since his diagnosis with depression almost two years ago. They have not only chosen to talk about Michael's struggles, but they appeared yesterday in a new educational documentary about teenage depression that debuted before nearly 300 people at the State House. Haas, who plans to study photography next fall at the Massachusetts College of Art and Design, said it was time for someone to speak up about an issue that, according to national estimates, affects more than 2 million American teenagers every year. "I'm happy to do it, especially since no one else seemed to be doing it," he said in an interview last week, wearing cargo pants and work boots in the living room of his family's home in Needham. "It can still be hard to talk about; it doesn't get easier," he said. "But I think it's too important. It's an opportunity that, if I didn't take, I'd probably never forgive myself." The documentary, called "Depression: True Stories," will be distributed to every middle school and high school in Boston, courtesy of Partners HealthCare network, which includes Brigham and Women's Hospital and Massachusetts General Hospital. The idea, said the film's producer, Jeanne Blake, is to help teenagers see that they do not have to suffer alone and can get help. Yesterday, Blake and others thanked the Haas family for coming forward. "People respond to that human story, that individual story, that family story," said Barbara Leadholm, commissioner of the state Department of Mental Health. "That is something that touches us." According to statistics, Michael Haas's story is common in Massachusetts. The most recent data from the state's biennial youth risk behavior survey, conducted in 2005, indicated that 27 percent of high school students felt sad or hopeless for more than two weeks, 13 percent seriously considered suicide, 12 percent made a plan to kill themselves, and 6 percent actually tried. An adolescent commits suicide in Massachusetts roughly once every two weeks, according to state figures, and that has left some communities scrambling to respond to tragedies in recent years. After a teen suicide in 2006, Arlington officials vowed to crack down on drug use, a factor in a death there. In Wellesley, where five teenagers have killed themselves in the last three years, town officials have formed a committee to address the issue and plan to distribute resource guides to parents this year. And in Needham, where students felt that officials initially tried to ignore the deaths, the town formed a suicide prevention coalition to raise awareness. Tom Denton, the Needham coalition's cochairman, said school officials and students are better informed now about depression and suicide than they were before. In the last year, he said, more youths have come forward to report signs of depression in their friends. But specialists say that conversations about depression do not come easily. "It's extremely difficult for parents to acknowledge it, because there's a lot of pain with acknowledging it, and also it's a hard thing to identify," said Jon Mattleman, who directs the Needham Youth Commission. "As human beings, we want to minimize things: 'Oh, it's just a stage he's going through. Oh, he'll feel better when basketball season is over.' But teen depression is very real." Haas's bout with depression, he now believes, started in elementary school. But the real problems began in high school, with the low point coming in 2005, in the fall of his junior year. Feeling pressure to please his parents, Haas no longer wanted to go to school. He withdrew from friends and family and refused to do homework. His parents - who also have a daughter, Rachel, 15 - missed the signs of depression, believing that their son was simply having academic problems. "He was really in pain for a long period of time, and we wrote it off as: 'That's Michael. That's his personality. He's a procrastinator,' " said his mother, Ronnie Haas, who works at MIT designing training programs for management. "We could see that things were hard. But we'd always look for a reason for it. We were quick to justify." Finally, a school counselor picked up on Haas's desperation, called his parents, and Haas soon checked himself into a psychiatric hospital. He was diagnosed with depression and put on antidepressants. But his problems continued, his parents said, as they quickly pushed him back to school. "There is a desire to stay with the group," said Haas's father, Chris, an operations manager at a manufacturing company. "To celebrate graduation on the day everybody celebrates graduation. Be talking about college when everybody is talking about college. There was momentum there." But Michael needed to pull back. Still depressed, he began to intentionally injure himself, he said, slicing his hands and forearms with razor blades, not to commit suicide, but to distract himself from the pain inside his head, he said. More counseling and medical help followed. The suicides did not add to his depression. "There wasn't much lower I could go," he said. But the reaction of officials and students fed his frustration. He was upset, he said, about an unwillingness to talk about his classmates' deaths at the time. He ultimately left Needham High to enroll at the Cambridge School of Weston in fall 2006. The antidepressants he was prescribed began to help, the family said. In time, Haas began to regain some control over his moods. With the help of regular therapy sessions and his medication, Haas is now feeling better. He still grapples with depression from time to time, but his life is richer now than ever before, he said. He is looking forward to studying photography next year at MassArt, Haas said. His favorite subjects to photograph, he said, are abandoned buildings and overlooked objects, things right before our eyes that some people simply do not see.